Cops and kids have always had a special relationship. The 1958 Norman Rockwell portrait “The Runaway,” which shows a trooper and a small child intent on running away both seated on counter stools at a restaurant, artfully depicts the simple trust a young child can have with an officer. That critical trust is needed more today than ever. One innovative way to do that is through a formal departmental youth mentoring program established in a partnership with the community—a collaborative effort with the police department and its union or association, both public and private schools, community services such as recreation, public health, and human services departments as well as the business community. The local Chamber of Commerce or similar organization could provide administrative and organizational support. 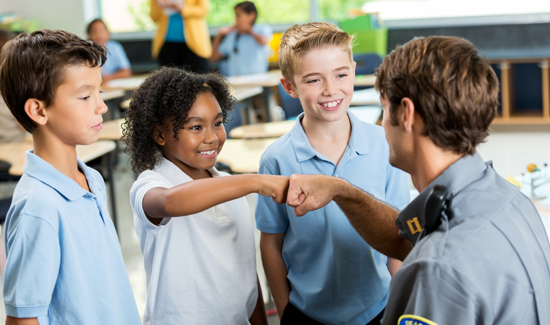 The goal is to provide an enriching and educational experience for young people who will benefit from having a positive relationship with law enforcement officers. The ideal situation is to have officers participate in the program while on duty and when staffing can support their attendance. A written policy would be required to establish guidelines, control of the program, and measures to track success. Parents would have to approve all activities involving their child and sign waiver liability forms. 1. Officers and deputies have numerous interactions with young people, both positive (school or safety program instruction) and negative (following an arrest or involvement with a disturbance.) During these encounters, officers may recognize a young person he or she feels would benefit from a mentoring program and forward that information to the program coordinators. 2. A parent may request that their child be part of the program. 3. Personnel from a public or private school may recognize a student who could benefit from the program and make a recommendation to the department. School resource officers are also an excellent way to get referrals for this type of program. 4. A Rabbi from a local temple or a priest or pastor at a church could make a recommendation with the approval of a parent. 5. Employees of other city agencies may be aware of children who would benefit from this program and make recommendations. 6. Local hospitals may also be aware of children with serious health problems who could benefit from some mentoring from a law enforcement officer. 7. Employees of businesses may have children who could benefit from a youth mentoring program and would be encouraged to participate. To keep a child’s interest, a mentoring program needs fun stuff to do while still providing an opportunity for the officer and child to talk and laugh. Depending on a child’s circumstances, the officer may have to pick up the child in a cruiser and then bring him home after an activity. This will factor into time involved and department scheduling allocations. The following list provides some direction on possible activities and time involved. The officer can start by giving a tour of the police department. This provides the child a chance to see the working environment of a law enforcement officer and ask questions about police work. The youngster could get a police shirt or cup as a momento. Lunch with the officer and the young person would take place at an eating establishment within the city. This experience is relaxing and non-threatening and allows for conversation and quality interaction. Generally it would only involve the officer and participant but if there is a strong interest in the program and sustainable staffing, two officers and two participants could go as a group. Two hour ride along with the officer. This allows an opportunity for more conversation and quality interaction but also provides an exciting, educational experience for the youngster who gets to ride in a police car with his or her mentor. Depending on the age of the child, the mentor could provide a class at the station on safety topics such as Internet safety using e-Copp, bike safety, basic self-defense, and safe driving. Multiple officers and participants could participate in group exercises such as a hike in a park, sled riding during the winter months, rock climbing or a visit to a local museum. These activities would occur mostly within the municipality limits but could venture further for visits to sporting events or museums. Times could run from 4 to 8 hours depending on transportation of the child, location of the event and time involved. With approval of the parent, a participant will be allowed to contact the officer while working or leave a phone message if off duty if the participant wants to discuss a matter that an officer could provide positive guidance on such as how to avoid pressure to use drugs or alcohol, gang avoidance, how to not engaging in reckless personal behavior or how to handle a bully situation. Officers participating in the program will complete short forms for any interaction with the child. These forms help provide accountability for the program and provide a tool for measuring its success. Length of participation in the program will be dependent upon officer/participant/parent interest. Upon completion in the program, a request will be made for the participant and the parents to complete a feedback form which also helps measure the success and overall value of the program. Officers who were the mentors will also complete a feedback form. Costs for the program would be generally limited to wages and activity expenditures. These costs would be shared through city funding, police association contributions and outside support from the business community and charitable organizations. The local Chamber of Commerce could assist with obtaining donations. Initial participation would involve police officers but could expand to interested dispatch/records and correction personnel. A youth mentoring outreach program can improve community relations which is so critical today. The costs to run the program are reasonable and it is likely that a significant number of law enforcement people would volunteer to help kids as they historically have. A youth mentoring outreach program of this nature is worth the effort that will pay off for generations to come. Tom Wetzel is a lieutenant in a suburban Ohio Police Department. Good Luck !!! I think your just setting yourselves up for lawsuits.Look what happened to Daniel Holtzclaw from allegations.